I always dreamed of having a big, open kitchen. Growing up, my mother cooked three meals a day in a quaint New England kitchen built in the 1950s, perhaps by Pilgrims, I’m not sure. The kitchen ‘island’ had not been invented, nor had the ‘breakfast nook’, though we had a back hall so cold it doubled as an extra fridge. The lonely kitchen was separated from the dining room by a long hallway. After college I lived in a cramped New York City apartment with a galley kitchen so small that I finally gave up cooking altogether, replacing my oven with a washer/dryer. When I finally bought my own little weekend cottage, there was barely room in the cozy kitchen to bake a biscuit, never mind a Bûche de Noël. As a cook, a baker and entertainer, I managed (my short ribs only caught fire once). But I kept the dream alive for that big, open kitchen we see in magazines– the one with a dining table in the kitchen, a long marble island with my friends gathered ‘round, drinking Cabernet while I whipped up Spaghetti à la Carbonara, serving it piping hot because I could. I got my opportunity a few years ago when a burst pipe created havoc in my home, spewing hot water and steam, the perfect incubator to refinish my kitchen cabinets in mold. When the mold police told me I had to take my kitchen back down to the studs, secretly I jumped for the joy of cooking as I decided, at that moment, I would create the open kitchen of my dreams. It took just about every cent I had, but I created my temple of tempura, my altar of al dente. With a kitchen and dining room in one, cooking and entertaining is a creative and social activity. No longer is the cook (me) isolated while the guests frolic; it’s a chef’s paradise! A baker’s bonanza! But I’m single. I like to cook for my friends. The truth is the open kitchen is a cook’s nightmare. If you can juggle 5 open flames while setting a table with fresh flowers and simultaneously pouring boiling liquids from behind your back in a room full of drunk people, great, because that’s what it is. The cocktail hour is especially trying. This is when timing is crucial, flash-frying the potatoes, sautéing the zucchini, roasting the chicken; it’s the cook’s version of synchronized swimming. More than once I’ve had a friend lean against the control panel of the oven, accidentally turning it off with her bum. It also happens to be the time when every guest is in need of a drink, a warm hello and an introduction; impossible to all happen while draining the fusilli. After dinner is even more awkward, when the dishes are in a guilt-inducing pile next to the sink. In an open kitchen, there is no escape. If you don’t like your guests, which happens, you cannot hide for a quick shot of vodka. At one especially excruciating dinner, I snuck into the basement to show off my furnace to a good friend. We stayed there for half an hour in my summer lounge chairs. Don’t get me wrong, I love my dream kitchen, with its 12 foot Bleu de Savoie marble island, two temperature-perfect Wolf ovens, a pair of dishwashers (one just for glasses!) and a separate farm sink for washing vegetables. 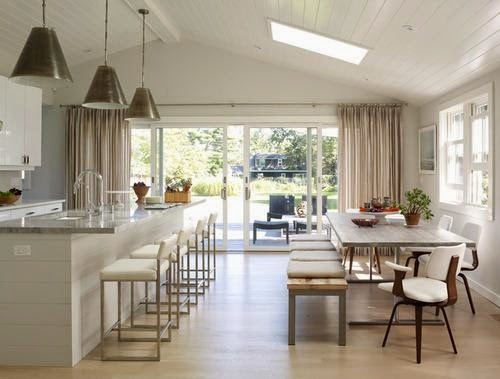 A dining table that seats 12, or 15 in a pinch, is just a few feet from the island. But I love my dream kitchen clean and orderly, with every slotted spoon in its place. While I was choosing materials, one designer friend told me about a client who kept parchment paper on his marble island to avoid water marks, at all times. It seemed extreme at the time, but not anymore. An open kitchen forces you to be more efficient and organized than ever before. Now when I entertain, I have everything out of the oven, pans washed and the table set before the guests arrive. It’s a pressure-cooker. Bottom line is, be careful what you wish for, especially when it comes to your dream kitchen. It may be a recipe for disaster.